The third set of booster pairs are directly behind the second stage. (That’s the core stage, they are numbered in the order they are dropped). Worth remembering that fuel is transferred from the boosters around the core trio of rockets as it ascends. That way the core stage is fully fuelled when the boosters drop. The separated view also shows clearly how the third stage is basically a “Proton” first stage, with half the engines. Here it is with all the parts clustered together, as they would be for launch. You can also clearly see the grid fins, as used on the N-1. These are more efficient at very high speeds. They are common on Russian rockets, much less so on western launchers. A set of perspective free views. The markings on the boosters and core stages are my own, though I think they are in keeping with the normal style. Markings on the lunar sections are taken from Chelomei’s mock ups. 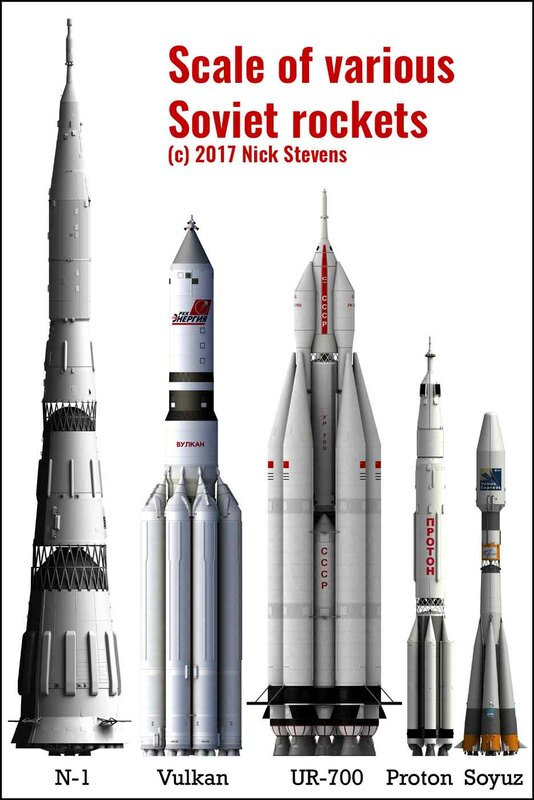 And finally, here’s a comparison of the scale of various key Soviet and Russian rockets. 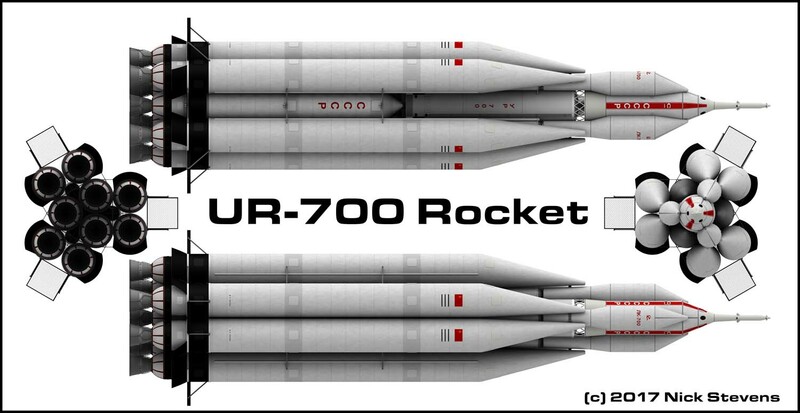 UR-700 and Vulkan unbuilt. 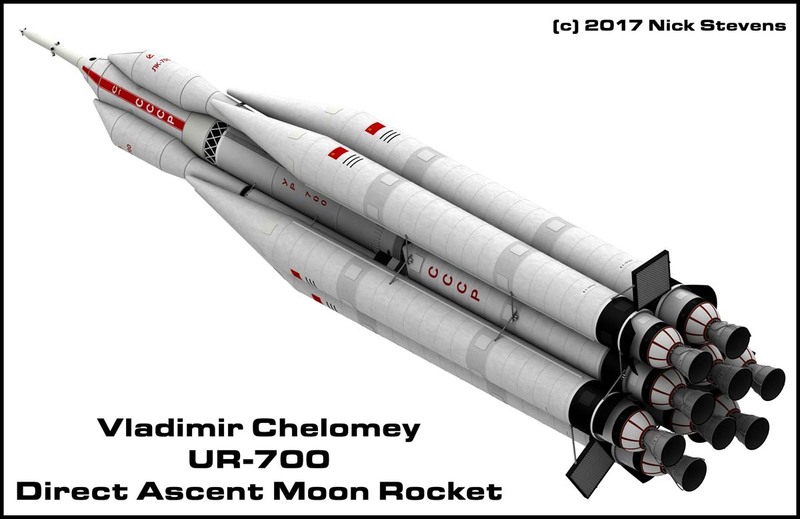 N-1 very similar in size to a Saturn V.
The UR-700. The All-N2O4/UDMH Launch Vehicle. That’s over 4,000 Tonnes of Toxic Hypergolic Chemical Bi-Propellant if memory serves me right. That said, Vladimir Chelomei did have one advantage in that his facilities were serving the Soviet Military, which demanded a higher quality than the Soviet Norms of the time, and thus had better facilities with which to make his LVs, Stations, and everything else. Not least in having its own backup Diesel Generators in the event of power failure. Plus, the UR-700 as you modelled it was made that way to permit testing of the individual stages within the existing facilities of the time, therefore debugging prior to flight was a possibility with this LV. So it’s not implausible to suggest that the higher QA of Chelomei’s OKB-52 would mean a higher-quality LV. Great to have a detailed informed comment, thank you! And naturally, about 2 months later, a UR-500 (Proton) of about 15% the Mass of the UR-700 exploded over the Launch Pad. They were forced to wait for the rain to wash away the toxic propellants which cost them the 1969 Mars Launch Window IIRC. Fantastic! 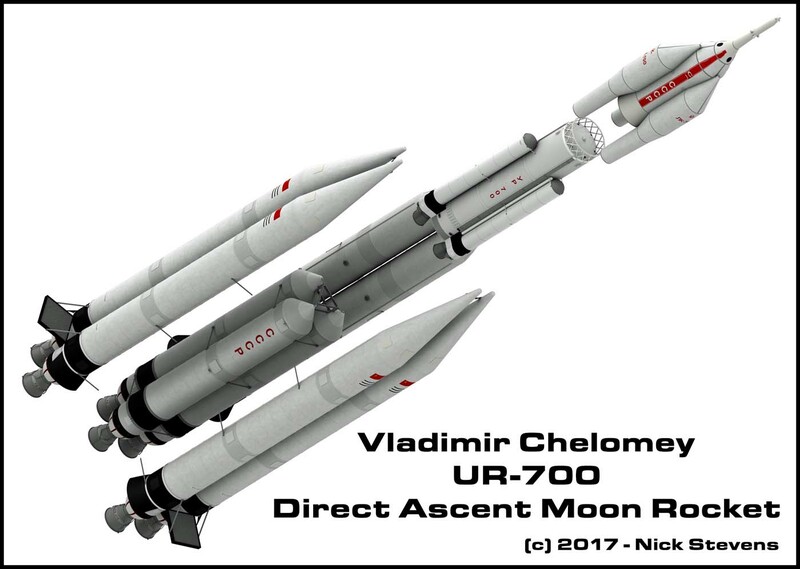 I stumbled upon a site that has pictures of the Chelomey Design Bureau’s 1:10 UR700 test model. It’s at http://frs-vetlana.livejournal.com/333518.html. Just in case you haven’t seen it. This was making the rounds today on Twitter, Nick, not sure why it didn’t in March. Either way, good to see it. Nice work!